The content of this article provides interesting history, facts and information about the Roman Legion. The Roman Army was one of the greatest armies that the world has ever seen. Just twenty-five Roman legions conquered the known world of their era and although the number of legions increased, they retained that conquest for five hundred years. The Roman Legion was the standing force of the empire numbering from one hundred and fifty thousand to two hundred and forty thousand men who were stationed in the various provinces. But what was a Roman Legion like? How many men made up a Roman Legion and how did a Roman Legion operate? Each legion had a Roman Standard, a bar across the top of the spear, with the letters on it S P Q R—Senatus, Populus Que Romanus—meaning the Roman Senate and People, a purple flag below and a figure above, such as an eagle, or the wolf and twins, or some emblem sacred to the Romans. The legions were on foot, but the troops of patricians and knights on horseback were attached to them and had to protect them. The History of the Roman Legion - Who was allowed to serve in a Roman Legion? For many centuries the Roman Legions was composed exclusively of Roman citizens. Up to the year B.C. 107, no one was permitted to serve among the regular soldiers except those who were regarded as possessing a strong personal interest in the stability of the Roman republic. Every Roman citizen was trained to arms and was liable to be called upon to serve in the armies. According to the Roman constitution, every free-born citizen was a soldier and bound to serve in the Roman legion in the army from the age of seventeen to forty-six. The general period of service for the infantry was twenty years, after which the soldier received a discharge, together with a bounty in money or land. The distant wars of the republic, such as the prolonged operations of Caesar in Gaul, made a standing army a necessity. During the civil wars between Caesar and Pompey the legions were forty in number; under Augustus the number decreased to twenty-five. Alexander Severus increased the legions to thirty-two. The army of Roman citizens was eventually replaced by a standing army made up of landless city dwellers and newly created citizens from outlying provinces. In the early age of the republic the legion was disbanded as soon as the special service was performed, and was in all essential respects a militia. Marius admitted all orders of citizens; and after the close of the Social War in B.C. 87, the whole free population of Italy was allowed to serve in a Roman Legion. The Emperor Claudius incorporated with the Roman legion the vanquished Goths, and after him the barbarians filled up the ranks of the legions on account of the degeneracy of the times. Under Romulus the legion contained 3000 foot-soldiers *** From the expulsion of the Kings from Rome until the second year of the Second Punic War the regular number in the Roman Legion may be fixed at 4000 or 4200 infantry *** From the latter period until the consulship of Marius the ordinary number in the Roman Legion was from 5000 to 5200 *** For some centuries after Marius the numbers in a Roman Legion varied from 5000 to 6200, generally approaching to the higher limit of 6000. Amid all the variations with regard to the infantry, 300 horsemen formed the regular complement of the legion. 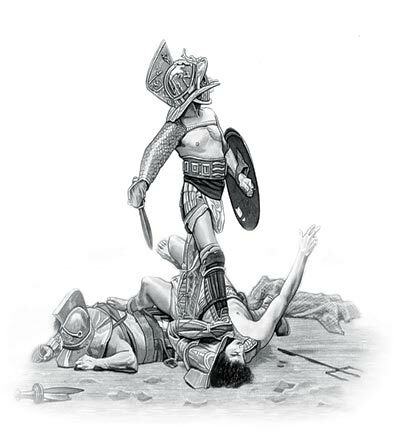 The main dependence of the Roman legion was on the infantry, which wore heavy armor, a helmet, a shield, a light spear called a pilum or javelin and a short cut-and-thrust sword with a double edge. Besides the armor and weapons of the legionary, he usually carried on the marches provisions for two weeks, three or four stakes used in forming the palisade of the camp, besides various tools. The Roman Legionary carried altogether a burden of sixty or eighty pounds per man. The cavalry attached to each legion consisted of three hundred men, who originally were selected from the leading men in the State. The cohortes equitates were the mixed cohorts of cavalry and infantry used in the first, second and third centuries AD. They were mounted at the expense of the State, and formed a distinct order. The cavalry was divided into ten squadrons. To each legion was attached ten military engines of the largest size and fifty-five of the smaller. All of these large weapons discharged stones and darts with great effect. The artillery were used both for hurling missiles in battle, and for the attack on fortresses. The content of this Roman Legion category provides free educational details, facts and information for reference and research for schools, colleges and homework. Refer to the Colosseum Sitemap for a comprehensive search on interesting different categories containing the history, facts and information about Ancient Rome.